When people think of Folsom today, they think of Johnny Cash and his 1968 performance at Folsom Prison. To celebrate that event, a limited edition collectible has been created that celebrates the connection between Cash, the prison, and the City of Folsom. Here’s the story behind this unique collectible that could only come out of Folsom. Folsom was established during California’s Gold Rush. Known as Granite City at the time, the town was home to gold miners seeking fortune and prospered due to the railway line that connected the town to the nearby city of Sacramento. In 1856 the mining town was renamed in honor of its founder, Army Captain Joseph Libby Folsom. California had its share of Gold Rush towns, but almost no other has the worldwide name recognition that Folsom does. Nearly fifty years ago a country musician recorded a live album at Folsom Prison and that performance and album forever altered the history of the town and the man: Johnny Cash. Cash was a musician who had been writing songs and playing the guitar since he was 12 years old. Before he began playing professionally, John R Cash wrote a song called Folsom Prison Blues while serving in the United States Air Force in 1953. 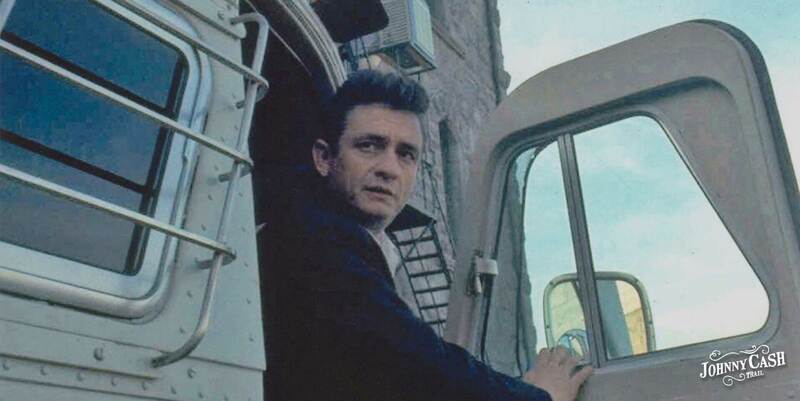 Cash found inspiration from the movie Inside the Walls of Folsom Prison. Two years later, Cash signed a recording deal with Sun Records and recorded Folsom Prison Blues with Sam Phillips producing Cash and fellow musicians Luther Perkins and Marshall Grant. By 1956, Folsom Prison Blues reached the #4 spot on the Billboard Country Western best seller chart. Cash’s career had taken off, but a hard-partying lifestyle, bad-boy reputation, and antics on and off the stage were taking a toll on his personal and professional life. In 1968, Cash lobbied to record a live album in front of a prison audience. He’d had success performing for inmates, beginning with his first prison performance in 1957 at Huntsville State Prison. Cash enjoyed playing at prisons where his bad-boy reputation served him well and resulted in an energized, enthusiastic audience. Sun Records gave Cash the green light, and the performance was pitched to two California penitentiaries: San Quentin and Folsom Prison. Folsom was the first to accept and the show was scheduled for January 13, 1968. The performance and resulting album, Johnny Cash Live at Folsom Prison, was a success. During his prison performance, Cash performed Folsom Prison Blues and the live version of the single skyrocketed to the #1 spot on the Billboard Country and Western chart and #32 on the Hot 100 in 1968. It also won Cash a Grammy award for Best Male Country Vocal the following year. Cash’s career was revived and Folsom Prison was suddenly the most well-known prison in the world. BThink you know everything there is to know about the Man in Black? How many of these questions can you answer? Folsom Prison is California’s second oldest penitentiary. Construction on Folsom Prison began in 1878, almost a full century before Cash would take the stage. In 1968, when Cash performed at Folsom, each inmate at the prison resided in his own cell and participated in an education program or learned a trade. One of these trade programs still exists today: the Folsom Prison license plate manufacturing facility. Since 19456, every license plate in California has been made at Folsom Prison. The facility, operated by the California Prison Industry Authority (CALPIA), produces approximately 45,000 license plates per day for the California Department of Motor Vehicles (DMV) – two for each newly registered car in the state. Today, more than 100 inmates work in the facility manufacturing the license plates. The inmates are part of CALPIA’s successful correctional industry programs which reduce recidivism, increase prison safety and enhance public safety. Inmates obtain job skills and certification in order to be successful once they are released. The license plate manufacturing program between CALPIA, DMV and Folsom Prison is an outstanding partnership among state government organizations to benefit Folsom inmates and the public. The City of Folsom is celebrating this connection between Johnny Cash, Folsom Prison, and the Folsom community with a unique collectible that features a limited edition license plate and photo of Johnny Cash taken in front of Folsom Prison. Together with the John R. Cash Revocable Trust, the City of Folsom, and CALPIA, the DMV has authorized 100 of these limited edition collectibles to be made in celebration of the 50th anniversary of Cash’s prison performance. The collectible JCASH 50 license plate is a California legacy plate; a black plate with yellow lettering like the ones used from 1963 to 1969. The classic black license plates were reintroduced in 2012 and are made from the same molds that were used in the 60s. The license plate is framed along with a picture of Johnny Cash standing in front of Folsom Prison’s east gate, taken by Dan Poush on January 13, 1968 - the day of Cash’s performance. Proceeds from these limited edition collectibles will contribute funding to the Johnny Cash Trail Art Project in Folsom, CA. The Johnny Cash Trail is a multi-class bike trail that crosses Folsom Prison property and includes the Johnny Cash Trail Bridge and newly constructed Robbers' Ravine Bridge. The entire trail takes cyclists and pedestrians from Folsom’s Historic District past the prison and up towards Folsom dam, offering expansive views of Folsom Lake and the American River along the way. The Johnny Cash trail will soon be home to eight world-class public art installations that honor the legacy of Johnny Cash in Folsom. Proceeds from the limited edition JCASH 50 license plate collectibles will go towards funding Cash’s Pick - the first of these art pieces. Only 100 people will get the chance to own this 50th-anniversary limited edition collectible made in Folsom Prison and celebrating Cash’s legendary performance and the impact the artist had on the lives of prisoners and the City of Folsom. The JCASH 50 plates are here, but one thing’s certain: they won’t last long.